Ceramic tile countertops are considered to be made from strong and sturdy countertop materials, but this does not mean that they cannot be damaged by careless behaviors. Anything heavy that is dropped on the surface of the countertop can crack or break the tiles and liquids penetrating the surface of the countertop can cause staining and the growth of molds and bacteria. When any of these situations occur, then the best course of action for the homeowner may be to repair the ceramic tile countertop to prevent further damage from occurring and to maintain the appearance of the countertop. Repairing a ceramic tile countertop can be done by a trained professional or by the homeowner if they are willing to follow directions and take the time to repair the countertop properly. There are many different types of reference materials available to help the homeowner to complete this task, including reference books written by experts and internet websites that provide detailed information on how to repair a ceramic tile countertop. The items that will be needed to repair the countertop may be found in almost any local home improvement store and many countertop manufacturers will also have any items that are needed which may be hard for the homeowner to find. A ceramic tile countertop is one of the easiest types of countertop to repair because the homeowner will only have to focus on the areas that are damaged instead of trying to repair the entire countertop. Tiles that are cracked, scratched, or broken can be removed one by one and replaced with other tiles without compromising the appearance of the countertop. In fact, many experts recommend obtaining a few extra ceramic countertop tiles when purchasing the new countertop so that if tiles need to be replaced at a later date, the proper matching tiles will already be on hand. 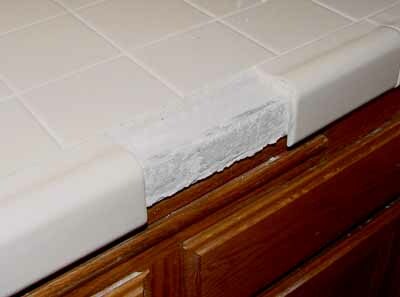 The first step in repairing a ceramic tile countertop is taking the damaged tiles off of the surface of the countertop. There is a tool called a grout saw that will be extremely helpful in this situation because it allows the homeowner to cut through the grout on all four sides of the damaged tile without damaging the tile further or damaging the countertop base beneath. After the grout joints have been cut, the ceramic tile can be pried from the surface of the countertop base, leaving a perfect hole where the damaged tile used to be. After the damaged tiles have been removed, it is time to place the new tiles in the vacant spaces on the countertop. There are special adhesives available that will secure the new tiles to the countertop and keep them in place as the joints between the tiles are filled with grout. If the ceramic tile countertop has been obtained directly from a manufacturer, the manufacturer will be able to recommend which tile adhesive and grout products will be best for use on the countertop. If the countertop was obtained from a home improvement store and installed by the homeowner, then the installation instructions for the countertop will let the homeowner know what products they will need to purchase to repair the countertop. Looking For Some Ceramic Tile Countertop Ideas?